Police in India have denied claims by former minister Shashi Tharoor that they pressured his domestic helper to confess that the two men had murdered his wife. On Tuesday, Delhi police said they were treating the death of Sunanda Pushkar as murder, nearly a year after her body was found in a hotel room. The police said Ms Pushkar's death was "not natural and was due to poisoning". Mr Tharoor will be questioned again in connection with the death, reports say. He said on Tuesday that he never "thought of any foul play" in the death of his wife, and that he was "anxious to see this case is investigated thoroughly". A letter written by Mr Tharoor to Delhi police chief BS Bassi in November in which he makes the allegation of coercion was leaked to the media on Wednesday. In it Mr Tharoor said a police officer had "repeatedly physically assaulted" his domestic helper during questioning and tried to "intimidate" him into "confessing that he and I murdered my wife". He also referred to a conversation with Mr Bassi and wrote: "As you graciously agreed, such conduct is completely unacceptable and illegal. It also amounts to the use of physical coercion in the attempt to frame an innocent man." "I would request you to take immediate and appropriate action against such unlawful misconduct of the officer concerned." Mr Bassi told reporters that he had received the letter from Mr Tharoor and investigated the allegation. "I had spoken to my officers about the allegations made in the letter and learnt that even though the person (domestic helper) was summoned, he was never tortured," he told reporters. 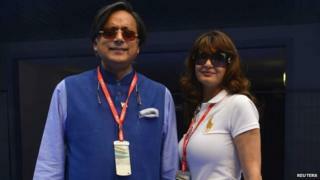 Mr Tharoor, a Congress MP, married Ms Pushkar, a former Dubai-based businesswoman, in 2010. She was found dead in a five-star hotel in Delhi on 17 January last year. The couple had became embroiled in controversy over a series of Twitter messages before Ms Pushkar's death that appeared to reveal he was having an affair with a Pakistani journalist. Ms Pushkar and Mr Tharoor later insisted they were happily married and blamed "unauthorised tweets" for causing confusion.